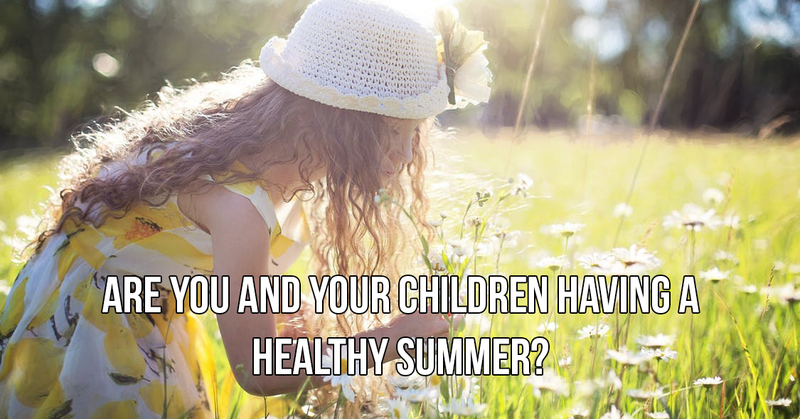 Blog | Pediatric Care | Are You and Your Children Having a Healthy Summer? With the kids home from school, they’ll need somewhere other than gym class to release their energy. Luckily, it doesn’t take too much of your energy to make sure you and the family are having a healthy summer. This is what it takes to keep your summer fit and fun. Summer is the most wonderful time of the year — for school children and people who like the heat, at least. Because of this, it would be terrible if you had to spend it in the urgent care center. Fitness might not be the first things on our mind when we’re having fun, but it should be up there. Luckily, many of our favorite summer activities help to keep us fit. Running around, swimming, and sweating are all great for your body. Summer fitness is easy! You need to pay a little attention to it, though. Summer has a host of issues it can cause as well, but we’ve been there and done that. Instead, today we’re going to discuss what you need to do to make sure those summer urgent care issues don’t creep into your life. From grocery shopping to cooking to swimming lessons, these are a few ways you can have a healthy summer. When most people think of fitness, they think of waking up earlier than they want to and going to the gym for longer than they want to. Drinking more water than they want to, eating healthier food than they want to. Fitness is discipline and, therefore, the exact opposite of fun. When it comes to the summertime, though, this needn’t be the case. Especially for young children, going outside and working up a sweat is a day well spent. There are many things that you can do in the summer to stay occupied. One small habit you can work up with yourself or with your family is to go for a walk after dinner. Typically in the late evening, the sun will be setting and bellies will be full. Everyone is home from work, and cooling down after a long hot day. Going for a short walk around the block can help the whole family burn some calories, and get ready for some more fun activity. It’s a great way to bond, as well. Put the phones away, pull the headphones out, and have a nice stroll and a good chat. It can do wonders for your family, and your body. Going to the beach can be great, as well. Swimming helps you burn calories while cooling down, making it the perfect summer activity. Regular trips to the beach can help you perfect your bikini body, and show it off while keeping your family occupied. Hiking can be fun, too. Go out and explore your local wilderness while getting a full body workout. Completing a hike isn’t easy, but that’s part of the appeal. Climbing to the top of a mountain is an accomplishment, and you should be proud of it as such. A big part of fitness is diet, but no one likes to cook in the heat. As a result, any summer diets are full of fast food and delivery. This isn’t always an issue. Infrequent trips to McDonald’s aren’t going to kill you. However, every night (or more frequent trips might.) Instead, you should consider moving to the grill, and not just for hamburgers and hot dogs. Chicken is often a healthier alternative for meat, but it’s the vegetable options that you should keep in mind. Have you ever tried grilled zucchini? It’s delicious! Similarly, crock pots are a great option for summer cooking. You can use a crockpot to cook when it’s cool, but still, have warm food when it’s time to eat. Of course, there is plenty of healthy food that doesn’t require heating up at all. Salads don’t need to be cooked and are easy to prepare. Subs and other sandwiches should always be on the menu, too, as they are an easy and healthy option. However, it might be best for you to leave the typical sides that go along with sandwiches out. The salt in potato chips and fries can dehydrate you, which is an effect it’s best to avoid in the summer. This is a delicate balance, though, as salt does help to replenish your body after a day of sweat. Just remember that there is no substitute for water on a hot day.